Get off I-40 at exit 275 in Santa Rosa, NM. Turn west onto Will Rogers Dr. and turn left onto Lake Dr and another left onto La Pradira Ave, Blue Hole will be on your left. 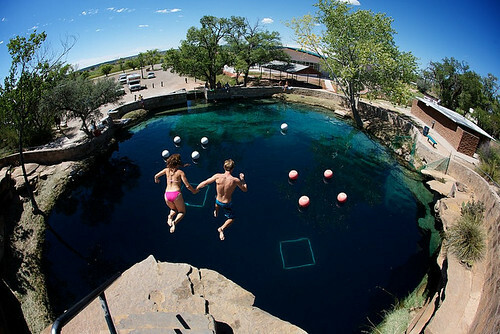 The Blue Hole of Santa Rosa is a circular, bell shaped pool east of Santa Rosa, New Mexico that is one of the most popular dive destinations in the US for SCUBA diving and training. It is a clear blue body of water with a constant 64 °F (18 °C) temperature and constant inflow of 3000 gallons per minute. While the surface is only 80 feet (24 m) in diameter, it expands to a diameter of 130 feet (40 m) at the bottom. Swimming is free.